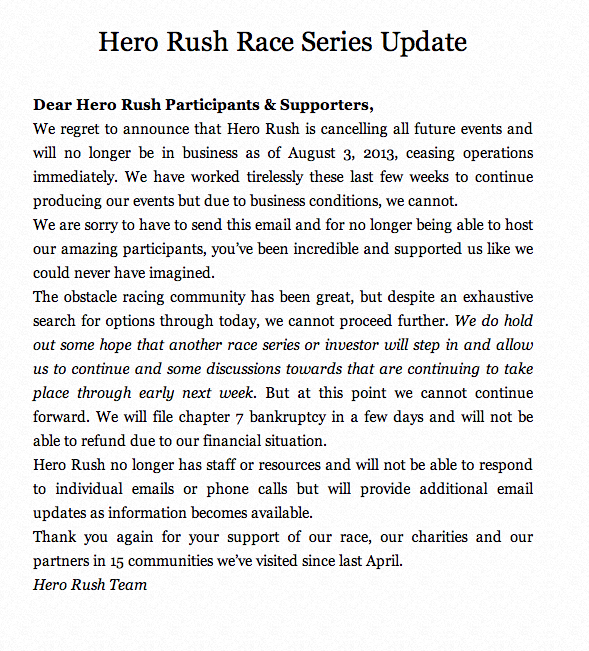 A sad day – Hero Rush has closed it’s doors, and filed for Chapter 7 bankruptcy. The OCR world is getting more and more competitive, it seems. Over the weekend, we’ll evaluate what we will do with our Hero Rush T Shirt orders – if you have suggestions, sound off in the comments. 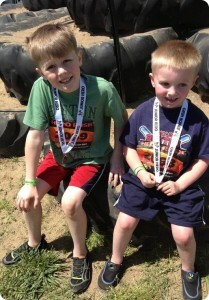 Hero Rush in Nashville, TN… Conquered it!! Last weekend, my family and I drove about 30 minutes, the shortest drive to an OCR yet for us, to conquer and decimate the Hero Rush. Ever since our Spartan Race in Georgia last month, we had been dying to get down and dirty and get our race on again. Normally, we would have worn whatever we could to represent the team, New England Spahtens, here in Tennessee but with all that happened in Boston, we (was my wife’s idea) decided to wear our Boston gear seeing as we are Massachusetts natives. We got many hoots of encouragement from people, lots of talk about Boston, especially from the PA announcer. Waves were going off every 30 minutes. Leah lined up and was off on her heat. We arrived and went right to check-in. It was so smooth, no complaints, they really had their stuff together. We walked over to the midway which was awesome. Tons of firetrucks and other first responder vehicles, which my 5 year old, Colin, loved! There was the usual merchandise table, which has all sorts of Hero Rush goodies. Alex was psyched to see the hoses on the outside of the pool racers had to run through. It was up to the kids to blast the racers with water as they came by, he was very happy to oblige! While she was off and running we found a mini course of sorts, one perfect sized for Colin, even though he did the kid’s heat and was the youngest on the course! It was a very small version of the adult race, but was fun for him none the less. Alex blasted right through it, a mere warm-up for the kids heat I’m sure. We took a walk around the course, it was very spectator friendly, and then we hunkered down to wait for Leah to pass us by. She blasted by, looking really good, not gassed at all. There were only three to four obstacles left from here. There were 21 total, and the distance was 4.1 miles. We followed along and met up with her at the finish line, where, with a huge smile she happily accepted her medal! It was my time, unfortunately right at the same time as the kids race, but the heats stopped at 1:30pm. That is probably my only complaint, the day should have been much longer. The air-horn went off and it was on. 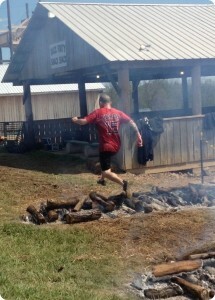 I raced up the platform, down the fire pole and hit the ground running. My legs felt great and my breath was in sync, this was going to be a great race. As we rounded the first corner it was the up, under and through walls obstacle. A short distance later was a creek with freezing cold water, but it was already warming up outside so the cold was refreshing. I tried to run, but Leah had mentioned that it wouldn’t be a great idea. Here in Tennessee a lot of the creeks and river have rock beds, or limestone beds. They can be sharp, they can drop off at any given moment, etc. Needless to say, it slowed me a bit to have to walk fast. The next obstacle, in the creek, was a bunch of swinging tires hanging from the trees, not difficult but fun. 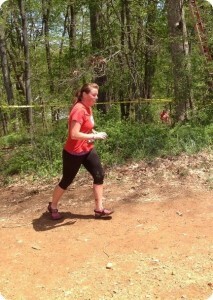 There were a ton of other obstacles, many of them typical for an OCR. What they did have that was different was a smoke house that they called the hoarders house. It was full of smoke, a vapor of sorts, and as you can tell by the name, had all sorts of mess everywhere. It was dark on top of the smoke, so it was really hard navigating around, I can just imagine what a fireman has to go through when they face this type of challenge in the real world. There was also an obstacle I oddly enough had a rough time time with. There were two large tubes which were filled with foam/ suds. You were supposed to go in one, cross through and come out the other. I would have had to do burpees had this been a Spartan because I did it twice. The first time I felt very claustrophobic and could not breathe, I started to panic and needed to get out. I got right back in though and got it done. Another obstacle was a two person “buddy carry” of sorts. There was another racer with me as I hit this obstacle and she grabbed one side of the dummy as I got the other and we had to bring it up and over a few obstacles. I was starting to gas a bit, but the woman that did the dummy carry with me hung out for a bit and we paced each other, trying to encourage the other to not slow down and keep it nice and steady. We hit the hill where the boys and I had seen Leah before, but from my vantage point before I had no idea just how rough the hill was. Now, coming at it from the other side, it was muddy as all heck and there were multiple fire hoses to help you climb up. Although it was a slight bit daunting, I just dug right in, bypassed the hoses, and spidered my way up the hill. Only a few more obstacles to go and it was done, nearly there. The last couple obstacles ws one that you had to shimmy up a pipe, get to the platform and slide down a tarp like slide into a pool of water. From there you rounded the corner where the kids were waiting to blast me with the firehoses. I jumped in the pool, took the water right in the face, jumped out and leapt over the three sets of firelogs and it was completion glory, I got my medal!! The only other complaint, the last I promise, was that I had ordered before hand a medium size finisher’s shirt. By the time I reached the end, there were no more. But, I was assured they would fastidiously send me one out in the mail, so soon enough I shall have it. All in all, I would 110% recommend this race. It was so much fun, not only for us adults, but for the kids as well. It is a family friendly environment. This particualr location was abundant in hills, which were quite the challenge, loved every minute of it!! Ok, last complaint, but this seems to be at ALL OCR’s, the concession stand had nothing but fried food to offer afterward. To me, this needs to change, at every OCR. It’s great if that’s what you want to eat, but after an hour (my official time was 1:04:30.02) the last thing I want to put in my body is a hot dog, french fries and fried chicken. I hear that the Ladies like the Firemen. I hear that the Firemen like the challenge? 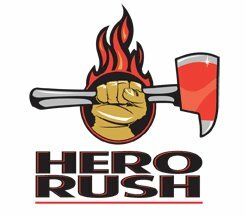 I also hear that Hero Rush is an awesome 5k obstacle race, and that in 2013 they’ll be coming to New England. Thats pretty damned cool enough. Whats even more awesome? 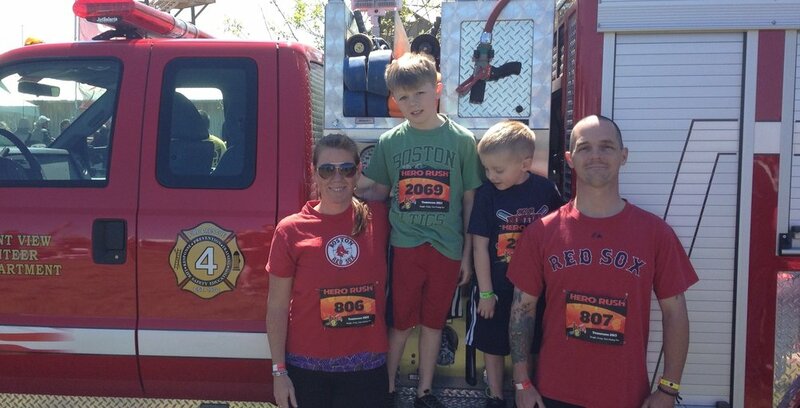 We are taking part in their memorial 343 heat at 11am. This will honor the 343 fallen firefighters from 9/11, and the extra $10 it costs will be donated to the National Fallen Firefighters Foundation.